The international team, led by scientists from University College London (UCL) in the UK, took observations of the nearby exoplanet 55 Cancri e, a super-Earth with a mass of eight Earth-masses. It is located in the planetary system of 55 Cancri, a star about 40 light-years from Earth. "This is a very exciting result because it's the first time that we have been able to find the spectral fingerprints that show the gases present in the atmosphere of a super-Earth," explains Angelos Tsiaras, a PhD student at UCL, who developed the analysis technique along with his colleagues Ingo Waldmann and Marco Rocchetto. "The observations of 55 Cancri e's atmosphere suggest that the planet has managed to cling on to a significant amount of hydrogen and helium from the nebula from which it originally formed." 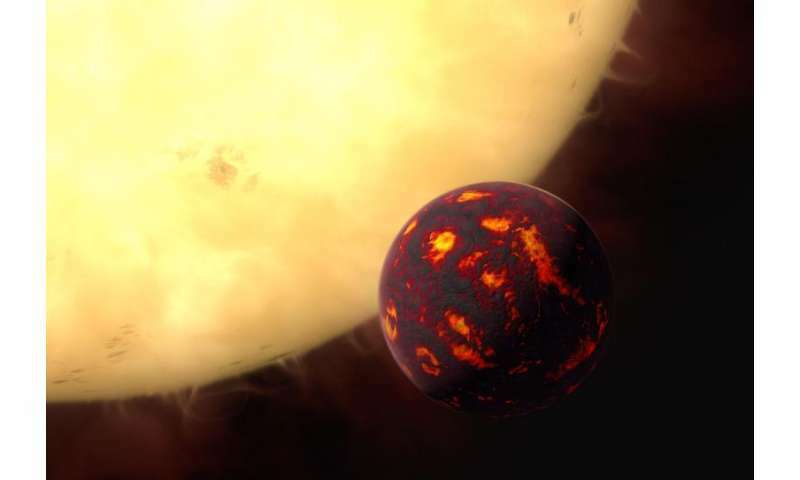 Super-Earths like 55 Cancri e are thought to be the most common type of planet in our galaxy. They acquired the name 'super-Earth' because they have a mass larger than that of the Earth but are still much smaller than the gas giants in the Solar System. The WFC3 instrument on Hubble has already been used to probe the atmospheres of two other super-Earths, but no spectral features were found in those previous studies. "This result gives a first insight into the atmosphere of a super-Earth. 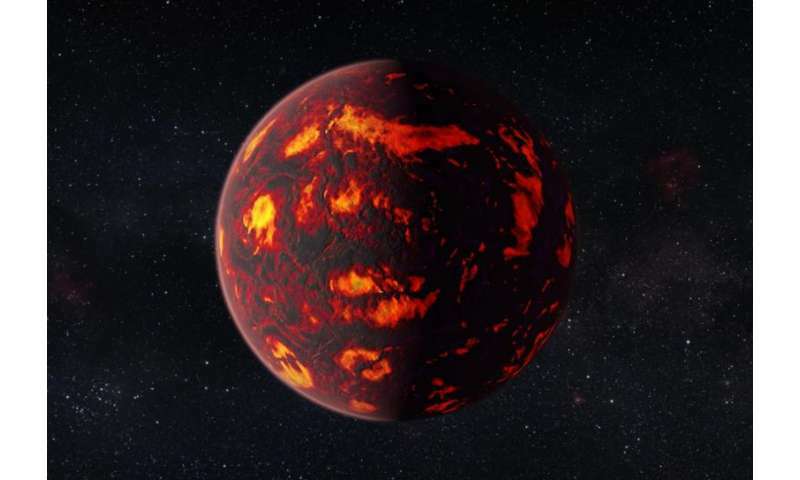 We now have clues as to what the planet is currently like and how it might have formed and evolved, and this has important implications for 55 Cancri e and other super-Earths," said Giovanna Tinetti, also from UCL, UK. "Such an amount of hydrogen cyanide would indicate an atmosphere with a very high ratio of carbon to oxygen," said Olivia Venot, KU Leuven, who developed an atmospheric chemical model of 55 Cancri e that supported the analysis of the observations. "If the presence of hydrogen cyanide and other molecules is confirmed in a few years time by the next generation of infrared telescopes, it would support the theory that this planet is indeed carbon rich and a very exotic place," concludes Jonathan Tennyson, UCL. "Although hydrogen cyanide, or prussic acid, is highly poisonous, so it is perhaps not a planet I would like to live on!" The results were summarized by Tsiaras et al. in the paper "Detection of an atmosphere around the super-Earth 55 Cancri e" which is going to be published in the Astrophysical Journal. It looks like someone is lying. Where is the solar wind? At a close distance from the star stellar wind has the greatest value. Here, one should always take the effects the dual (binary) system. In these the conditions the only, is possible density of 5.9 + 1.5 -1.1 g cm -3. Planet (if the data is partially credible) is molten body (1,700 ° C small?) is not gaseous. The ultimate is time to stop with comparision, guesswork and accept, the already published legality of the formation of the body. It seems ridiculous assertion that the gaseous planet has a density of 6 g cm -3. WOW is this line correct "A year on the exoplanet lasts for only 18 hours"??? If that is the case, then this planet is SO CLOSE to it's star, surely any Hydrogen and Helium would have "boiled" away??? The only explanation I have for it staying, is that the atmosphere of this planet is from the STAR itself!!! Perhaps the planet is constantly getting it's atmosphere renewed from the Star. I also think they need a better name than Super Earth. As this planet CLEARLY is NOTHING like Earth. Mass should not indicate "EARTH" like. Uranus is 14.5 times the Mass of Earth, should we call Uranus a "Super Earth"???? I would agree that this planet is way too close to the star. At those speeds, it's probably well inside the corona. Planet Janssen...that must have been one of the lamest jokes of the Dutch astronomical institute so far. there's still quite a gap between the corona and this star. Yes, it is very close. A lot closer than e.g. Mercury is to the Sun. But the star is also quite a bit smaller than the sun. 55 Cancri e has a semi major axis of 2.3 million kilometers, not 2.3bn km. The parent star, 55 Cancri A is a G-type star similar to our sun whose corona extends for millions of kilometers, so yes, it is possible 55 Cancri e is in its parent star's corona, at least some of the time. The artist's impression drawing above is a little misleading because most the planet would be glowing like the inside of a blast furnace. At 2 Earth radii [Wikipedia], Janssen - as 55 Cancri e is named - is above the 1.5 Earth radii limit where planets starts to have lower apparent densities than Earth as seen by mass vs radius observations. So the observed atmosphere composition confirms the statistical mass-radius observation. @bhj, Sonhouse: "they need a better name than Super Earth", "'sub-Neptunian". The newer descriptions are not written in rocks either, you can certainly say sub.Neptunian, but FWIW you tend to see Mini Neptune used for planets between 2 and 4 (= Neptune) Earth radii. And I am going to call Janssen a mini-Neptune as well, now that we know it is a gassy planet. @bhj: I am sure the observation of close, hot Jupiters with intact atmospheres was a surprise for planet hunters as well. But these systems tend to be young, and astronomers have seen atmospheres "boil away" from close gassy planets. In other words, these planets bring their atmospheres, and it is first when the initial atmosphere has gone that you can expect some sort of gas balance between star and planet. "At 1.6 Earth radii there is a ~ 50 % likelihood for a planet to be gassy." Generally speaking, the bigger a planet is, the thicker its atmosphere is more likely to be. Beyond 1.6 Earth radii they are more likely to be gassy. While we can try to determine the precise correlation between planet size and atmosphere, the actual predictibility based on radius alone is probably poor for ~Earth-sized planets. Earth itself has sufficient gravity for a far larger atmosphere. For example, Saturn's gravity is comparable to Earth's and the planet is a gas giant. Venus has less gravity and a much more dense atmosphere. The atmospheric pressure on Earth is in what percentile of similar Earth radius planets (+/- 2%) in this galaxy? This "compare to earth"...implying that makes it relevant...is really stupid. 8x earth's mass with a H/He atmosphere. Why isn't that a "little Uranus"? Same mass comparison, better atmospheric match. Because "little Uranus" isn't as interesting as "super Earth". Unless you're talking about damned wduckss. Wrong. 8 times bigger than the earth, or 8 times smaller than Uranus. The phrase is pure pandering to the public. You can't create a good reason for it. 1/2 the size of Uranus, I think you mean, AGW, which only makes your point stronger. LOL wducksss is definitely a little Uranus. There are several super Uranus' posting on here as well. Maybe a better name would be 'sub-Neptunian' or 'sub-Uranus' (Sub-Uranian)?